Designed by the North American architect, Frank O. Gehry, this unique museum built on a 32,500 m2 site in the centre of Bilbao represents an amazing construction feat. On one side it runs down to the waterside of the Nervión River, 16 meters below the level of the rest of the city of Bilbao. And one end is pierced by the huge Puente de La Salve, one of the main access routes into the city. The building itself is an extraordinary combination of interconnecting shapes. Orthogonal blocks in limestone contrast with curved and bent forms covered in titanium. Glass curtain walls provide the building with the light and transparency it needs. Owing to their mathematical complexity, the sinuous stone, glass and titanium curves were designed with the aid of computers. The glass walls were made and installed to protect the works of art from heat and radiation. The half millimeter thick ‘fish-scale’ titanium panels covering most of the building are guaranteed to last one hundred years. As a whole, Gehry’s design creates a spectacular, eminently visible structure that has the presence of a huge sculpture set against the backdrop of the city. People coming from Calle Iparraguirre, one of the main streets bisecting the centre of Bilbao diagonally, are led directly to the main entrance; the idea was to bring the city right to the doors of the building. A broad flight of steps takes pedestrians down to the museum hall, although descending flights of steps are not a frequent feature of institutional buildings. This is an inspired response to the differences in height between the level of the river and the level of the city centre. It also enables a building with a surface area of 24,000 m2 and more than 50 metres high to be slotted into the city landscape without towering over the neighbouring buildings. Visitors passing through the hall to the exhibition areas come immediately to the atrium, the real heart of the museum and one of the most idiosyncratic features of Gehry’s design, which has a sort of metal flower skylight at the top that allows a stream of light to illuminate the warm, inviting space. From the atrium, the visitor is given the opportunity to access a terrace covered by a canopy supported by a single stone pillar. The canopy serves a function (better appreciated perhaps from the other bank of the river, which offers observers an excellent view of the entire rear facade of the museum) that is both protective and aesthetic at one and the same time. The broad flight of stairs that goes up to the sculptural tower, conceived as a device to absorb and integrate the Puente de La Salve into the overall architectural scheme of the building, is also a public access way that connects pedestrians with the rest of the city. Exhibition galleries are organised on three levels around the central atrium and are connected by a system of curving walkways suspended from the roof, glass elevators and stair turrets. 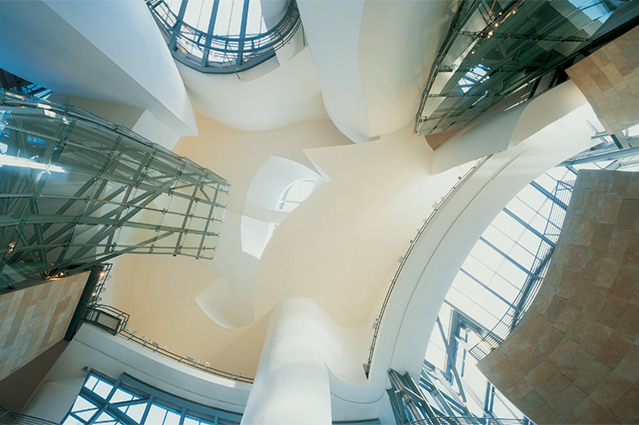 All in all, a spectacular vision that one critic has described as a metaphorical city, where the panels of glass that cover the elevator-well evoke the scales of a fish that leaps and spins, the walkways that climb the interior walls are like vertical motorways, and the plaster curves crowning the atrium suggest the moulded ribbing of a drawing by Willem de Kooning. In short, a glimpse of artifice in architectural design taken to its uttermost limits. © FMGB. Guggenheim Bilbao Museoa, Bilbao, 2006. Photo: Erika Barahona Ede.